New Flings Pop-Up Bins make trash and recycling collection easier in your home, at events, or when you're on the go. Flings start out flat for easy storing and portability, and then pop up in a flash whenever and wherever you need them. The decorative patterns are attractive for all occasions and help signal where the trash and recycling are supposed to go. These bins are convenient, portable, and always ready to use. Place them around your event and let trash and recycling clean-up take care of itself so you can sit back and enjoy the party. 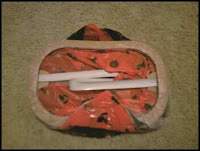 Afterward, just tie and toss, or recycle and re-use. Flings Bins really make cleanup a snap! Every Flings Bin is 13 gallon tall kitchen size and leak proof so you never have to worry about a thing, and they feature a built-in drawstring for easy disposal. 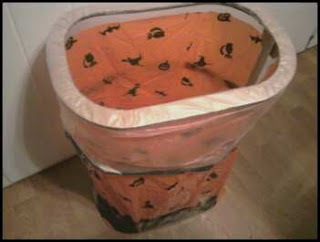 I received the Halloween fling bin, just in time for my Halloween party at the end of October! It is great and I was impressed that it was the same size as my kitchen trash bin. It will add to the Halloween decor as well as prove to be very functional since it will allow me to have a bin somewhere in the house aside from the kitchen. I am thinking I will put this downstairs since after my last party I found tons of plates and cups sitting around all over downstairs because I didn't have a trash bin in the family room. I love that these bins are cute as well as functional, and the recycle bins are a great idea since they make it so easy to recycle and to alert your guests on what to toss in the bin. Fling Bins offers different themes for bins, like holiday, celebration, birthday, and BBQ. These are prefect for any occasion, especially big events like graduation parties or costume parties! Buy It: You can purchase Fling Bins online - $15.99 for 4 bins, or buy single bins on Amazon.com for only $3.99. Flings is giving away 2 Flings Halloween bins for just a penny! Make your Halloween party the neatest and most convenient ever! 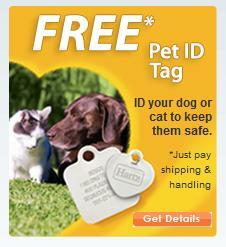 Just click this link to pay 1 penny plus regular shipping and handling of $5. Take a picture of the bin at your party (perhaps with you and your friends in costume), upload it to your Facebook page, link it to us, and we'll refund your shipping and handling onto your credit card. It's a scary good deal! Win It: Enter here to win a set of Fling Bins! Leave a comment for each entry and include a way for me to contact you. Mandatory Entry: Tell me what event/occasion you would use Fling Bins for. Contest Details: Giveaway will end on Thursday, October 14 at 11:59 pm (CT). US residents only. Winner will be drawn via number generator Random.org. Winner will be contacted by email and will have 48 hours to reply. Disclaimer: I was given this product free of charge for the purpose of this review. All opinions are my own experiences with the product. Individual results may vary. No other compensation was given. I'd definately use it for bbq's or seafood night! we have a halloween party planned and I bet the kids will get a kick out this. Plus, it is easy to tell the difference between regular garbage and recyclables. I'd use this for a party or the recycling one for everyday use. BBQ's and anytime we have company over for drinks... the trash can always overflows so fast. lol. What a great giveaway and product-thanks for hosting this! We always have Thanksgiving dinner and a Christmas brunch at our house-they'd definately get used for them! I'd also use them for our everyday recycling. 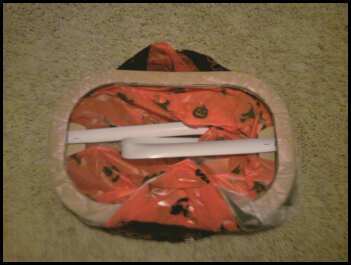 It really piles up and I've been thinking I need a real bin for it instead of the dinky plastic bags I've been using. I'd use them at our next neighborhood block party. I would use these for our Halloween Party! And the recycling one for my sons bday party to make sure nothing recyclable is tossed in the garage. Theses bags would be so great to win! 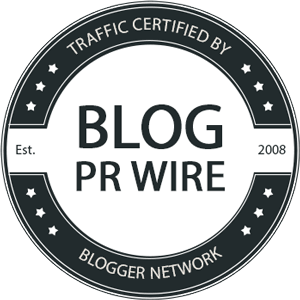 I am a new follower to your other blog Ready2GetHealthy. Birthday parties would be perfect for these! A great place to catch all the wrapping paper!